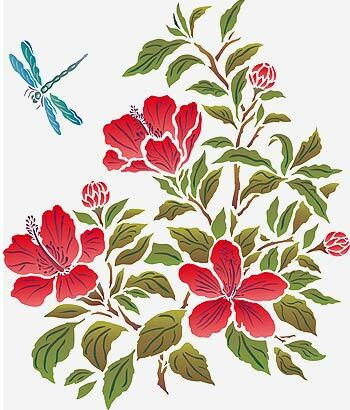 The Hibiscus Flower & Dragonfly Stencil depicts the beautiful summer blooms of the exotic Hibiscus flower, with its full blooms and buds. 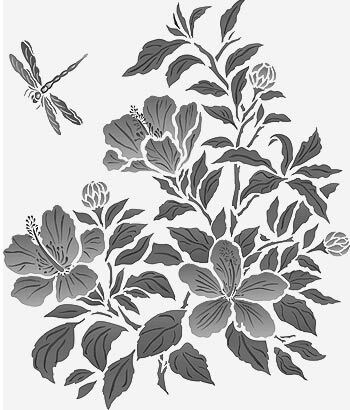 This stencil motif contains three full flowers, three globe-like buds and a charming dragonfly. 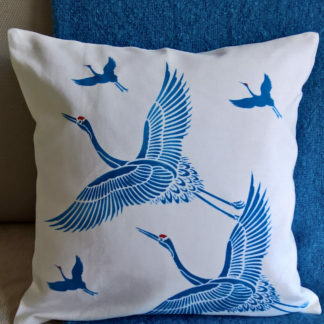 This large design works perfectly as a picture motif on panels or in frames, or stencilled on cushion covers, blinds or on cabinet and cupboard doors. Also try on summer clothes, bags and accessories. 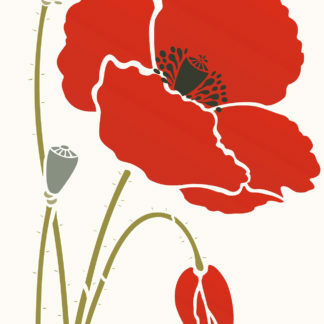 This two layer stencil comes with easy to use registration dots forperfect alignment. See size and layout specifications below. 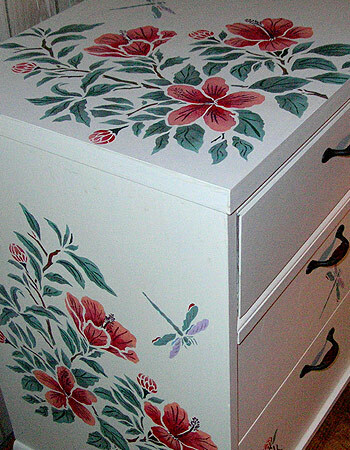 Above and top – the Hibiscus Flower & Dragonfly Stencil has been lovelingly used to decorate and create this beautiful chest by one of our great customers in the US. 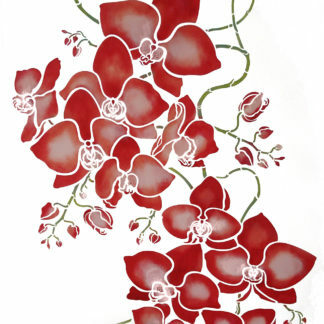 Stencil Paints used Very Berry, Azalea, Eucalyptus, Sea Green, Coffee Bean (layer one) and Woodland and Agapanthus (layer two). 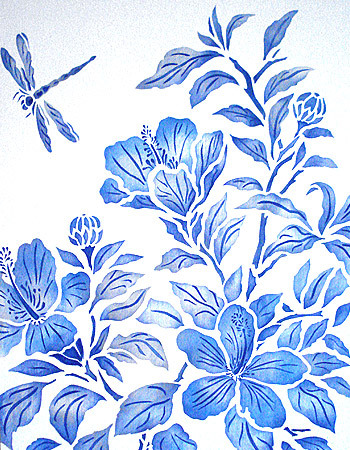 Dragonfly in Forget-me-not and Sea Green Stencil Paints. 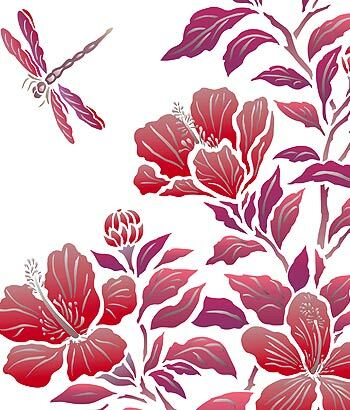 Above – the Hibiscus Flower and Dragonfly Stencil in Very Berry, Forget-me-not and Indian Purple Stencil Paints (layer one) with Silver Lights Metallic Stencil Paints for the layer two details. 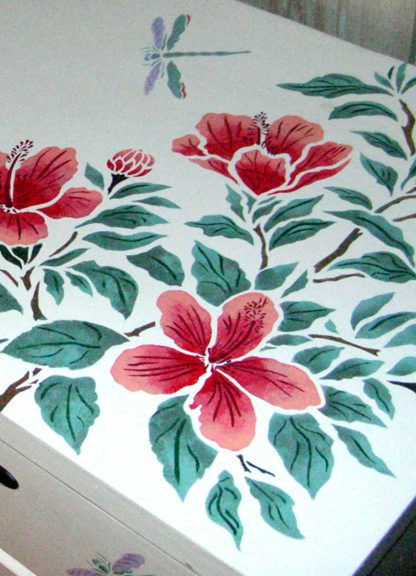 See also Hibiscus Flower Stencil 1, Hibiscus Flower Stencil 2 and the Large Hibiscus Flower Border. 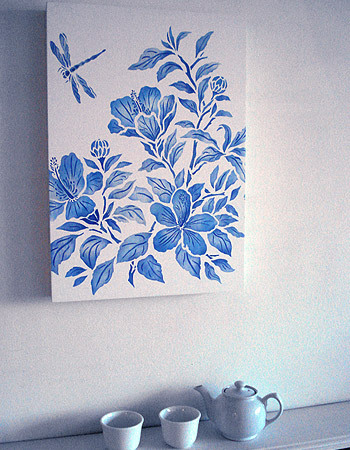 Above – Hibiscus Flower & Dragonfly Stencil stencilled simply on a white painted board in different blues, blushed with silver. 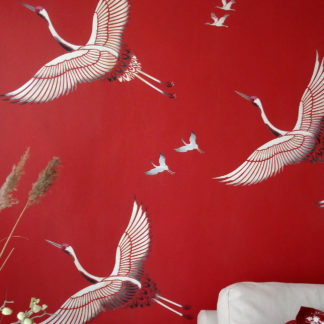 Paints used –Persian Blue, China Blue and Morning Glory Stencil Paints, with Silver Light Metallic Stencil Paint. Below – the board is hung in living area setting. 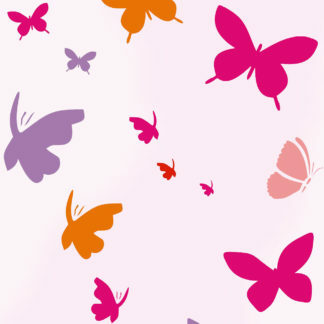 Above – Hibiscus Flower & Dragonfly Stencil in Very Berry, Azalea, Olive Grove and Verbena Stencil Paints (layer one) and Emerald Forest and Indian Purple Stencil Paints (layer two). Dragonfly in Kingfisher and Sea Green with Silver Lights Metallic Stencil Paint layer two details. 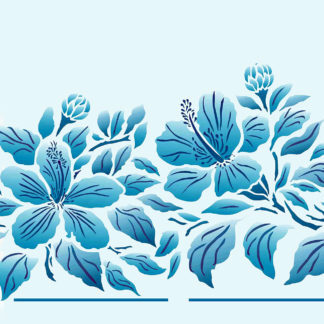 Above – close up detail of the Hibiscus Flower and Dragonfly Stencil in Persian Blue, Paradise Blue, Emerald Forest and Oasis Stencil Paints (layer one) with Silver Lights Metallic Stencil Paints for the layer two details. 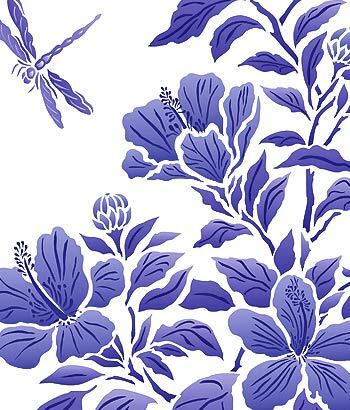 Above – close up detail of the Hibiscus Flower and Dragonfly Stencil in China Blue, French Lavender and Agapanthus Stencil Paints. Two layer two sheet stencil. 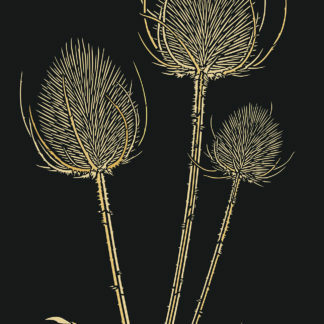 Overall motif measures up to approximately 40cm (15.75″) high by 34cm (13.25″) wide at widest points. 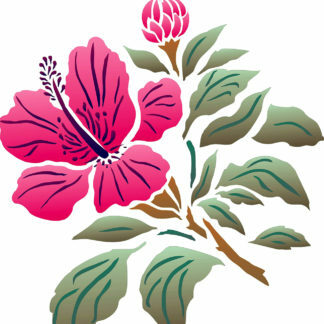 The Hibiscus blooms measure up to approximately 11cm (4.25″) at widest points. The integral dragonfly motif measures up to 10cm (4″) across the wing span. Left – the layout of the Hibiscus Flower & Dragonfly Stencil. Comes on two sheets.